On Saturday, head to Mohawk Austin at 1 p.m. for Quesoff, which was canceled last year due to rain (what's that again?). 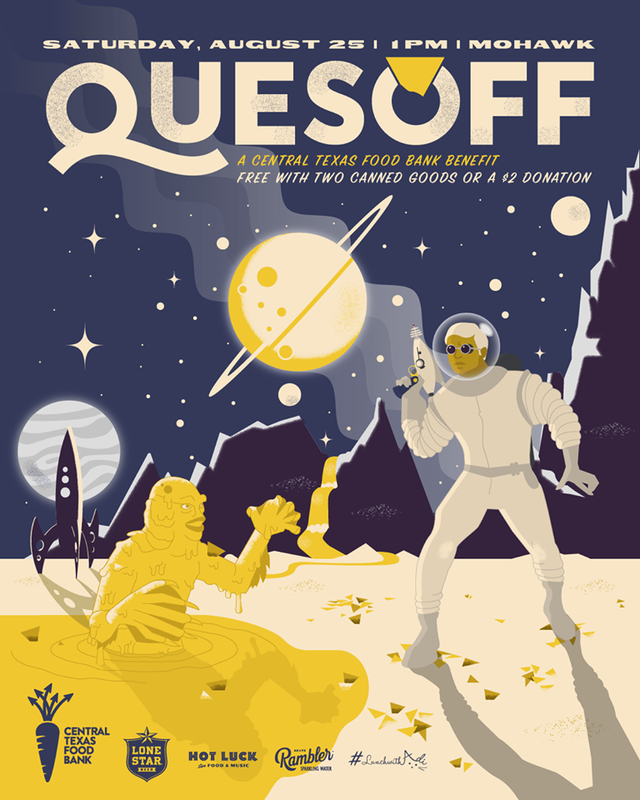 If you've never been to Quesoff, you're in for SO MUCH CHEESE. I've been twice, and I swore off cheese for a while both times. Which is, like, super shocking since I love cheeeeeeeese! Admission is two canned goods donation or $2 per person. Bags of chips are $5 a piece. Proceeds will benefit the Central Texas Food Bank, so don't be stingy, y'all! Basically, the gist of the event is this: you grab your bag of chips and then run around the Mohawk to sample all the quesos. This year's teams include past winners Frank, Cheesus and the Austin Facial Hair Club; along with a whole slew of local eateries and businesses like Dai Due, Micklethewait Craft Meats, Central Standard, Il Brutto, Fresa's, Better Half, Scholz Garten, Trudy's, Pelóns, Mama Fu's, Austin Daily Press, Jo's Downtown, Posse East, Kesos Taco House, Counterfeit Queso, Asador Mexican BBQ, Austin's Pizza, Liberation Kitchen, as well as 'home teams' such as Downtown Cheesy Brown, Wing-A-Licious and Gooey. Plus hotels Intercontinental Stephen F. Austin Hotel and The LINE Austin, and just straight up land masses Willigan's Island and Jaime's Spanish Village. WHEW. Pro-tip: Sip a Lone Star beer in between bites to break up all that fat. Water simply won't do the trick. Trust me! 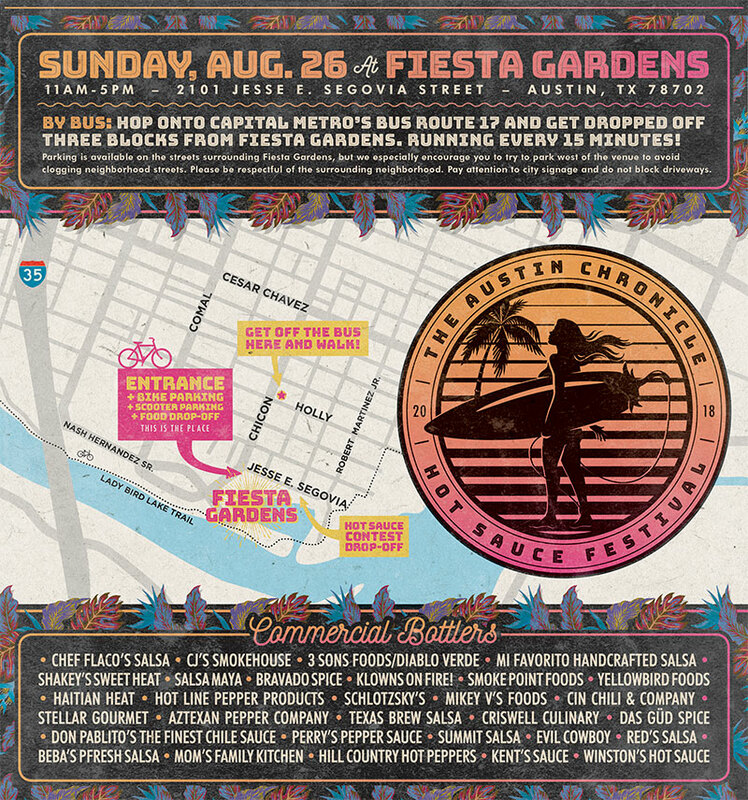 Then, on Sunday, head to Fiesta Gardens for the 28th Annual Hot Sauce Festival. From 11 a.m. to 5 p.m., you can sample HUNDREDS of hot sauces and sample other delicious foods. Entry is either a cash donation of $5 or three non-perishable foods, as the event also benefits the Central Texas Food Bank. Prepare to sweat all over from the heat and the spice in your mouth!